Greek mythology traditionally conveys a blend of excitement, intrigue, scandal and fun. A significant part of many middle school curricula, it easily lends itself to exploration through readers theatre distinctly because of its trademark high drama and action. 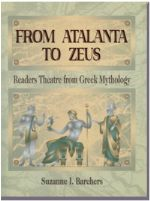 Each of these 26 scripts introduces one or more characters from Greek mythology and chronicles some of the important surrounding mythical events. Through these scripts, students actively participate in building their oral reading and presentation skills and learn more about the realities of ancient Greek life. The detailed index of names and places, including a pronunciation guide, encourages further studies. Ideal for grades 4-9, the scripts are adaptable for high school use as well.